DXpedtitions - Public Service - Scuba Diving Home Page. Amateur Radio, also known as " Ham Radio ", Computers and Scuba Diving are a great combination of Hobbies. I have been very fortunate to enjoy them together, specially when I travel to Islands on DXpeditions for DX Contesting. scuba diving and Island adventures. Ham Radio usually gets through when other conventional means of communications (like telephones) are down. DX means contacting other Hams in distant countries. I have worked 280 countries so far. During a DX Contest, it is not unusual to work over 100 countries in 48 hours. a rare contact. 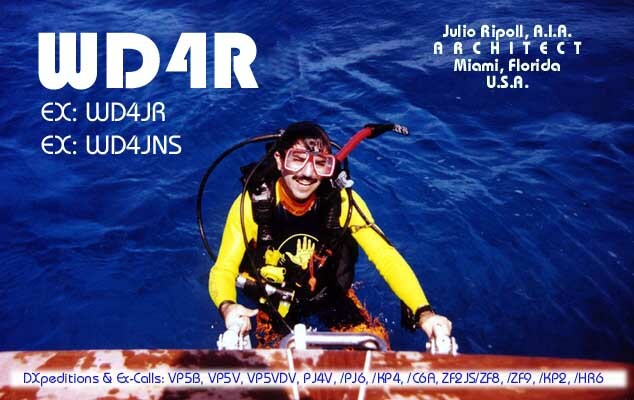 The contact is confirmed with a QSL card similar to the one above and has the statistics of the contact on the back. Licensed Amateur Radio Operator since 1977, Extra Class License. Scuba Diver since 1989, PADI Rescue Diver. World Trade Center and the Pentagon.